Climate scientist Roy Spencer believes the world surface station temp data may be irreparably corrupt, and essentially worthless in its current form. "There is majority support for either changing MMP or ditching it entirely. Only 23% wanted to keep MMP as it is now compared to 40% who wanted to keep MMP with changes and 32% who would prefer another voting system." CRU's Phil Jones, whose work claiming UHI is not a significant factor in global temperature trends has been trumpeted by less intelligent believers in AGW, is in the gun over more dodgy data. ""Hughes and Balling report that the mean annual air temperature trend of the five large cities averaged 0.24°C per decade, while the mean warming rate of the 19 non-urban centers was a statistically insignificant 0.09°C per decade over the 1960-1990 period, which values are to be compared to the overall warming rate of 0.31°C per decade that was derived by Jones for the entire country....suggest that urbanization has influenced the Jones (1994) records for South Africa over the 1960-1990 period of apparent rapid warming....and that their analyses suggest that "half or more of this recent warming may be related to urban growth, and not to any widespread regional temperature increase." A few weeks ago it was reported the IPCC was wrong on its claims of increasing hurricane and cyclone activity due to global warming. Warmists hit back by claiming the paragraph in question was citing a 'study' on the costs of hurricane and storm damage, and therefore not directly disproving the claims about hurricanes in general. "In terms of global tropical cyclone frequency, it was concluded25 that there was no significant change in global tropical storm or hurricane numbers from 1970 to 2004, nor any significant change in hurricane numbers for any individual basin over that period, except for the Atlantic (discussed above). Landfall in various regions of East Asia26 during the past 60 years, and those in the Philippines27 during the past century, also do not show significant trends." I didn't get too involved in the argy bargy originally, because I figured if there was no trend in costs then it was more than likely there was no trend in storms. Seems I was right to assume that. Telecom's ongoing XT problems are the result of a business philosophy based on gutting your core business units and spinning them off. The corporation has, in the name of fooling its shareholders, embarked on an alleged efficiency programme that involved contracting out/selling its maintenance, much of its network operations and of course its directory service. The bottom line is we now have a phone company that doesn't have many people left capable of running a phone company, and which doesn't have effective control of its own infrastructure. Telecom is almost a shell, relying on outsiders to do its main work, and if the outsiders are not smart enough or committed enough, or have worked on the basis of providing the cheapest quote rather than the best quote, then the end result is chaos. The heartbreak for the UN IPCC continues with revelations it grossly underestimated the growing extent of Antarctic sea ice, in order to underscore the "it's worse than we thought" meme. Meanwhile, the latest Rasmussen Poll in the US finds only 1 in 3 Americans still believes global warming is mostly human caused, which is about the bedrock level of belief in UFOs as well. The 35% figure is a huge slump from 47% a year and a half ago. NIWA's David Wratt defends this? NIWA climate scientist David Wratt is on record in this week's Listener magazine defending the UN IPPC's work. Perhaps he could defend the IPCC position in the graph below. The IPCC claims Scandinavian temperature anomalies are higher than ever. The real data shows Scandinavia is back where it was in the 1930s, and it includes a mysterious downward trend in the 20th century that appears to be missing from the IPCC version. I meant to highlight this on Saturday when I posted on Phil Jones' revelatory interview with the BBC. Now that it's made the front page of some newspapers around the world, I realise I was remiss. JONES: Yes, but only just. According to Bromirski, storm-driven ocean swells travel across the Pacific Ocean and break along the coastlines of North and South America, where they are transformed into very long-period ocean waves called "infragravity waves" that travel vast distances to Antarctica. Bromirski, along with coauthors Olga Sergienko of Princeton University and Douglas MacAyeal of the University of Chicago, propose that the southbound travelling infragravity waves "may be a key mechanical agent that contributes to the production and/or expansion of the pre-existing crevasse fields on ice shelves," and that the infragravity waves also may provide the trigger necessary to initiate the collapse process. 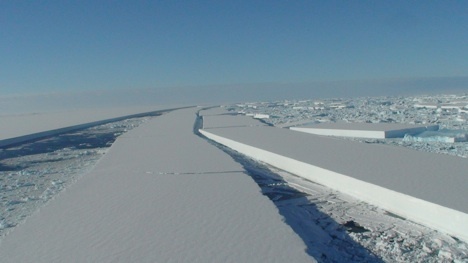 The study found that each of the Wilkins Ice Shelf breakup events in 2008 coincided with the estimated arrival of infragravity waves. The authors note that such waves could affect ice shelf stability by opening crevasses, reducing ice integrity through fracturing and initiating a collapse. "(Infragravity waves) may produce ice-shelf fractures that enable abrupt disintegration of ice shelves that are also affected by strong surface melting," the authors note in the paper. In separate research published last year, Bromirski and Peter Gerstoft of Scripps Oceanography showed that infragravity waves along the West Coast also generate a curious "hum"-subsonic noise too low for humans to hear (see Scripps explorations story Earth Sounds from Central America).